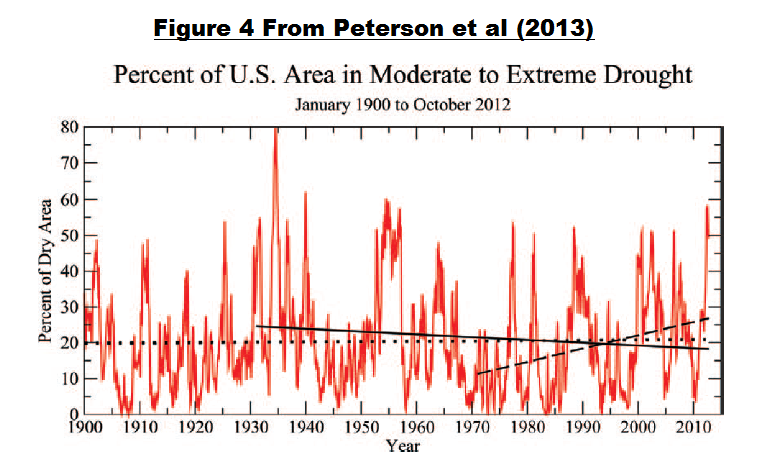 Extreme Weather – A Quick Note about Peterson et al (2013) | Watts Up With That? But, but, but its worse… Oh never mind. When I see a graph like figure 4 what I see is there’s nothing unusual and natural variation is very large. Thanks for the quick synopsis Bob. For Fig 1, how did they select/establish 4-days as an event? Exceeding the statistical 5-year event counts as “extreme?” Maybe looking at temps is different than rainfall, but if i picked a 5-year 96-hour storm event to compare rain events to, I would have the engineering world puzzled. That drought of the 1950s was vicious. My father was a small-town farm implement dealer in Texas at the time and it busted us. I grew up thinking land was supposed to have big cracks in it, and even today an approaching thunderstorm cheers me up. One factor never mentioned as a contributor to floods in the North Central region is tile drainage on farms. Almost all farms in North America, particularly in comparatively flat country have installed tile drainage to accelerate spring runoff and to handle heavy rains. By definition, this is an enhancer of floods, speeding up the transfer of water from the catchment basin to the main rivers. It would be a nice trick if they could take the flood waters and transfer it down to TX-NM-AZ. Maybe a pipeline for water makes sense. Do you think Texas could use 9km^3 of water an hour? One big problem I have with trying to look at climate trends with extreme weather is the relative paucity of the data compared to the day in, day out data that we have. I track snowfall and “Snow Depth Days” at home and for several people in the northeast and have been struck by how incredibly noisy the data is. Not only does the data swing widely at each station from year to year, comparing stations yields surprising swings too. For example, my data near Concord NH is sometimes similar to Derry NH (about 30 miles SSE), but there are years when I’ve had much more and even a couple where snowfall was similar but SDDs (the snow depth for each summed together) were quite different. This is generally due to the storm track, but the early/late season timing of big storms comes into play too. I’ll try to scrounge time to write a post about it before the snow season starts. People can keep looking for a signal, e.g. disparity in soil moisture east and west of the Mississippi River, but I suspect most efforts like that will include data torture. Once again the AGW promotion industry does not allow the lack of facts or data in support of their claim stand in the way of their chosen task. Other contributors to flooding, in addition to tile drainage on farms, are destruction of wetland areas, paving over of (and other impervious building within) drainage areas, and the close management of rivers with systems of dams, levees, and dredged channels for shipping purposes. This is especially true in the Northeast, but also true in other parts of the country. When people with some scientific knowledge write to project their fears onto the future, it is called science fiction. We are warned that our behavior will push the planet past tipping points, which never happened in the past (or we would not be here), which are not happening now (all trends are within historical variability), but it is claimed the destruction will surely come in the future if we don’t do something now. Classical science fiction mixed hopes in with the fears, imagining the possibilities as well as the dangers. But with climate science fiction, only doomsday scenarios are allowed. Amazing, the slope of the increase since the 70’s is the same as that for the 1919 to 40 period, but the second is due to CO2 and the first can’t be by their theory. Such a perversion of science. 1. To the extent that this paper came from historically accurate data (not created with the current doctored — fraudulently altered — “climate” data) and the study has integrity, who are these brave scientific souls? “A who’s who of climatologists, including department heads, from numerous organizations around the United States.” Apparently, they do not notice that warming has, at least, stalled; however, they do notice that there has been a warmer, drought-inducing American past. Bravo. I think they deserve some more individual notice from WUWT and other sources. In this way “alternative institutions”, like WUWT has become, are created. If universities and science organizations turn into fraudulent or religious institutions, then alternative organizations honoring the scientific method will carry science and historical accuracy forward. How to continue to spread, communicate, these truths becomes important. 3. By identifying those scientists with integrity and communicating the truths they put forward, we might be able to turn to thoughts of life and prosperity: both CO2 and water as basic elements of abundant human (and other) life. When the religious or authoritarian ones yell “drought” as if the sky was falling and their magic wands are desperately needed, we might calmly show that drought as a human calamity can “easily” be ended. As always, thank you, Anthony and colleagues. The data indicate that over the last several decades heat waves are generally increasing, while cold waves are decreasing. If one looks at fig 1 it is obvious that this trend only occurs if one limits the analysis to the last several decades. if one looks at the full set of data, then the trend disappears. If anything the long term trend on fig 1 shows there has been no significant climate change in the US for the past 100 years, or perhaps even a slight cooling. More likely the end points in the conclusion were purposely chosen to be consistent with the assumption of recent warming, knowing full well that the longer term data did not support the conclusion. In other words, the scientists involved knowingly told a “fib” so that their report would be politically correct. There was a time when we used to shake our heads in wonder at the Soviet Union for its politically correct science and the devastation it caused. How could such a thing happen we would ask. All the while feeling smug and secure in the knowledge that it could never happen here. Our system was so much superior, our freedom of speech guaranteed we would quickly uncover such errors before they did any harm. Extreme weather. I noticed the 2014 AMS Annual Meeting was so themed. With little else. How come no graphs on “perfect” weather trends? Don’t tell me we can’t find perfectspots! These damned spots are the most skittish bunch of entities I have ever seen. Bob (or anyone), could you please comment on this issue? I’ve been under the impression that the CO2-based AGW hypothesis generally asserts that a warming will disproportionately occur in the higher latitudes. Is that right? If so, the relative difference in temperatures between the tropics and the poles should be reduced, which should reduce overall atmospheric and oceanic convection, the primary driver of jet streams, trade winds and ocean currents, which are themselves the primary drivers of natural oscillations, both long term and short term. Is that a fair representation? If CO2-based warming causes a loss of global convection, should not the incidence and intensity of extreme weather also be reduced, and ocean and atmospheric waming patterns become more consistent, with less variability? By my eyes, droughts seem less likely during periods of warming. The only real trend coming from all of the monitoring of all things is the trend of increased imaginary or fabricated trends. Why don’t they just conclude that all of the random and moving variability making it impossible to detect real trends is a new chaos humans have created. But “last several decades” might be within one PDO state event, and not comparing it to the opposing state. But, but…that’s not what UCS claims! “This summer’s heat has been brutal. A surprisingly early June heatwave broke records in the western United States. The heat sent people to emergency rooms and stoked wildfires that destroyed homes and lives. Wildfire season in the West — fueled by extreme heat and water stress — is now nearly two months longer than in the 1970s. Europe and Asia recently suffered dangerous heat waves, too. Steve, that is perfect. We see what we want to see. AGWers look for terrible things and find them. No one is looking for perfect weather extremes. But what if increased CO2 correlates with perfect trends? How does drought correlate with PDO? It seems to me that weather is a function of the jet stream and regions of high and low pressure, on a hemispherical scale. These might be phenomenologically related, I’m not a meteorologist or a climate scientist. To attribute changes in the occurrences of extreme weather events to increasing concentrations of CO2 in the atmosphere, it would seem that a connection between changes in CO2 concentrations and changes in the jet stream and high and low pressures. Thus this would seem to require demonstrations of a higher-order chain of connections of change: change in CO2 concentrations have directly caused changes in the jet stream and high and low pressure and these in turn have caused changes in weather and these in turn have caused changes in occurrences of extreme weather events. I think the signal would be lost in the noise long before you get to the end of the chain. Not the least problem being that weather is very likely chaotic, making detection of the causes of change difficult. Especially difficult when thine scales of a few days are the focus. All this begs the question of how single extreme weather events, on the order of days, can be related to climate, the latter being defined as some kind of average of weather over long periods of time, on the order of a few decades. Generally, changes in the state of the sub-systems internal to the earth’s climate system are driven by gradients of the driving potentials for mass, momentum, energy, chemical and biological change. It is possible for the gradients to remain the same while changes occur in, say, the overall level of the temperature of the climate system. Gradients in the driving potentials will always and forever be present internal to the earth’s climate system. Thermal, mechanical, chemical and biological equilibrium between, and within, sub-systems will never be obtained. The gradients drive life. Mickey Reno: You’re not alone with your thoughts. I’ve seen that argument expressed many times. Polar amplification should reduce the temperature difference (absolute) between the tropics and the poles, and weather events, like tornados, that are tied to the temperature differences should decrease. The climate as a whole from 1850-2005 has been one of the most stable benign climate periods during the past 20000 years. This article again has it’s facts wrong in that the climate has shown a tendency toward more persistence post 2009 , if not more extreme, and that AGW theory has called for a less extreme climate going forward not a more extreme climate. AGW theory has consistently called for a more zonal atmospheric circulation pattern due to man made gloval warming which equates to a +ao or less extreme climate. Almost everywhere, daily minimum temperatures are projected to increase faster than daily maximum temperatures, leading to a decrease in diurnal temperature range. Average arctic temperatures increased at almost twice the global average rate in the past 100 years. I call BS on figure 1. They made a concerted effort to hide how extraordinary the 1930s really were. If you look at figure 1 closely you will see many areas of the country the values actually go off the graphs. For those areas they have put unreadable white splotches at the upper end of the red bars. Those are supposed be numbers showing the actual value, but being unreadable you can’t tell what the true value happens to be. All you have to judge by is the intentionally shortened bar on the graph. The Great Plains north and south, Midwest, Southeast, and United States all go off the top of the graph in the 1930s. The only other one is the Southwest in 2000s. A couple of the cold(blue) bars go also go off the graphs. Here is how NOAA defines heat wave. They don’t even define cold wave. A period of abnormally and uncomfortably hot and unusually humid weather. Typically a heat wave lasts two or more days. Here is a graphic I made up a few months ago which is a tally by decade of when the current high/low temperature record for each of the 12 months was set for all 50 states since 1880. Personally, I think it is much easier to comprehend. They said that an increase in co2 would make the atmospheric circulation more zonal(+ao) which would mean cold Arctic air would be confined to the polar regions, and not be able to penetrate very far south. Under this pattern cold Arctic air would be confined to the polar regions and would not be able to invade the middle latitudes, the overall effect being to warm the N.H. The reality is the opposite is happening the atmospheric circulation has been becoming more meridional, meaning the polar vortex has been weakening making the higher latitudes warm in comparisome to the lower latitudes,which can recieve cold out breaks of Arctic air under this pattern. The N.H. will cool overall under this pattern of a more meridional atmospheric circulation pattern or a neg. arctic oscillation pattern..
#1 I can’t speak for other regions, but in the Northeast the 60s, 70s and 80s were all drier than most of the 90s and definitely the 21st century. Drier soil loses heat faster and thus can promote colder minimum temperatures than moist soil (think how much the temperature usually drops at night in the desert versus a seashore). #2 many of the official stations (e.g. BWI) have become more under the influence of UHI as development in 2013 is much more than 1963. UHI causes much higher minimums and higher maximums than the surrounding countryside – pretty much in line with what’s happened and WUWT has been all over this along with improperly placed stations. The disparity continues to grow between the UHI-located stations and what the weather is everywhere else. A day when I see 85/62 shows up at the stations as 90/70. 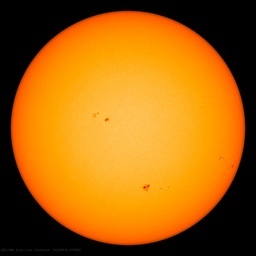 #3 I am beginning to think that the 1930’s are trying to be hidden much like the Medieval Warm Period. If past temperatures keep getting adjusted downward, 50 years from now the 1930s will somehow be colder than the next 20 years despite the countless record high temperature readings that still stand from that decade. So the likes of Karl and Peterson appear to be picking up some wisdom from us “deniers” and, although they can’t quite bring themselves to admit that “Global Warming” is not happening, they present data that clearly shows that this is the case. The obligatory defense of Warming is rather mild (“While this is in keeping with expectations in a warming climate, decadal variations … do not correlate that closely with the warming”). Perhaps some of the wisdom that has infiltrated NCDC may work its way up the food chain to Lubchenco and beyond – ya think? I know some of the co-authors who have not been dogmatic about Warming (as the NCDC gang has), and inclusion of their “just the facts, ma’am” approach is a good sign. The linked BAMS PDF above must have compressed the graphic making the numbers unreadable even when enlarged. I found a different PDF of the report here. If you enlarge this figure 1 graphic you can read the actual values. All the graphic scales max out at 2.0. Here are the actual 1930s heat wave values where the bars have been cropped. Several of the bars should be much longer than they are if actually scaled properly. By cropping the bars and using small text they hope to fool the reader into thinking the 1930s were not much worse than recently when the 1930s was actually hellish in most of the country. Must have been the low co2. It’s frustrating the way many of these climate scientists try to obfuscate what the data shows. This is what climate “scientists” do…they just can’t help themselves. Bottom line , if the ‘models ‘ were worth a dam they never need to push the ‘extreme weather ‘ angle in the first place . Its actually they failure to match their claims against reality that was lead to them scrambling around desperately grasping anything ,i.e deep sea ‘heat ‘ , to cover their tracks. In all, its a sign of their weakness that they have to do this. It shows the heat wave index was highest in the 1930s. That is true, and, in actual U.S. temperature history, there has been zero net warming since the 1930s, not even a tenth of a degree, with temperatures in the 1930s hitting a high not exceeded anytime afterwards. The heat wave index correlates with the high in temperature then if real data rather than fudged revisionist data is used (with an example of the difference in http://s24.postimg.org/rbbws9o85/overview.gif ). Figure 1 would make the higher heat wave index of the 1930s United States average even far more blatant if it didn’t cut off its max scale at 2.0 when such is a 3.1 value. I’d agree with you about the graphs being done in an amateur manner except for the fact that it was done by professionals. This leads me to believe it was intentional. Within a few seconds of viewing those graphs I realized an unnatural number of red bars went all the way to the top of the graphs. That led me to look closer. I’m an amateur, if I noticed I would expect a professional intending to put their name on the document would also notice. There were 28 professionals named on the document. 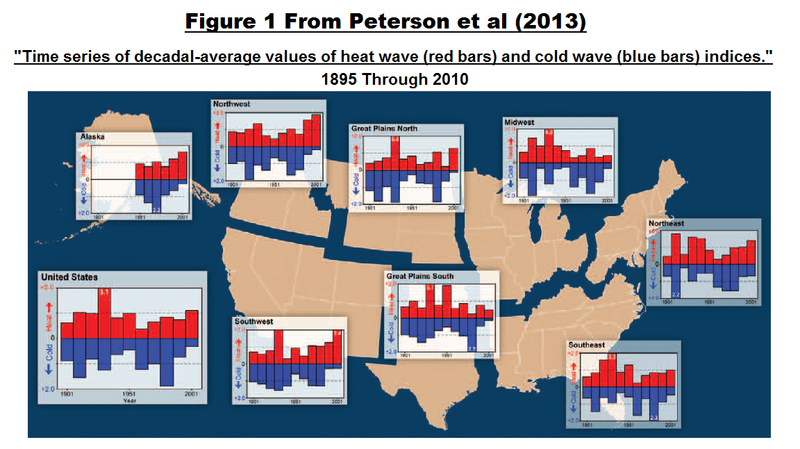 At least one of the authors of figure 1 above also authored this heat wave graphic found on the EPA site. It’s hard to believe they didn’t notice. They might have even been responsible for the graphic above. When I look over this paper, I don’t see anything about climate in it. I see a lot of discussion and analysis about weather, not climate. As a biologist, I measure climate in very long timelines; its mirrored in the population densities and distributions of species. These, in my holistic view, are the proxies (ooooooooooo!) for the definition of a climate, not a select pattern of artificially derived patterns of (mostly) localized weather phenomenon whose cyclicity can’t be known as of yet. And there’s the paradox of climate discussions: we can’t define a climate in a manner that suits us all, so we really just talk and argue about the weather, instead, and call it “climatology”. My comment at August 26, 2013 at 9:39 am has an error in the description of my graphic http://i46.tinypic.com/9gy2hx.gif. Last paragraph omit strikeout in first sentence. There is only one high/low record shown per state. Here is a graphic I made up a few months ago which is a tally by decade of when the current high/low temperature record for each of the 12 months was set for all 50 states since 1880. Another contributor to flooding, in addition to tile drainage on farms is idiots building on sand spits, river deltas and flood plains. I checked the topo maps to make sure I was well above the flood plain when I built my house. My neighbors who have built since then are going to get wiped out the next time a big hurricane comes inland in North Carolina. I saw 3 to 5 feet of standing water 20 years ago where their houses are now. …..If CO2-based warming causes a loss of global convection, should not the incidence and intensity of extreme weather also be reduced, and ocean and atmospheric waming patterns become more consistent, with less variability? ….I am beginning to think that the 1930′s are trying to be hidden much like the Medieval Warm Period. If past temperatures keep getting adjusted downward, 50 years from now the 1930s will somehow be colder than the next 20 years despite the countless record high temperature readings that still stand from that decade. … so we … just talk … about the weather… . LOL. What one does when one has nothing to say without either lying or putting oneself in grave danger of being handed one’s hat and coat. Re: river flooding — Here, in the upper left hand corner of the continental U.S., the Fantasy Science Club’s regulations make the dredging of them verboten. Thus, rivers around here flood more readily than they used to. Hey, Gail, heh, heh, what do you want to bet that our biggest fan, ol’ (blank)Jim, stomps over here to offer a few suggestions for improving our writing? LOL, at least he thinks there’s still hope for us. I wasted an hour reading and re-reading Peterson et al. (2013) to discover that it says essentially…………………….NOTHING. We need to defund these people. I built my house near the top of some high ground in Carrboro, North Carolina. The only ground above me was 24 acres of woodland, so it took a couple of days for torrential rains to trickle through my property that was served by a 10 inch drain pipe. Six years later the Chapel Hill-Carrboro City Schools clear cut the forest, built two schools there and installed a 24 inch drain pipe discharging directly into my property with the result that my home was flooded 14 times. The school district lawyer claimed that I was at fault for building my home in the path of the school district’s drainage system. While I like Peterson as a person, I reject his ideas just as I rejected those of the equally professional Chapel Hill-Carrboro City Schools administrators. Every day we have another example of data torture followed by fabricated conclusions, and I am sure readers of this blog are familiar that this is a pattern in climate science where political expectation has become so interwoven with the poliics of advocacy that nothing can be believed any more. The science has been trashed by the advocates of CAGW, but the general public are generally unaware of what has been happening. There are so many examples that there is now enough material for a media organisation to create a series of television programs, and such a series would really make a good scoop. The climate science edifice is built so high on such weak foundations that it is now very unstable, it would take only a few well chosen pushes to topple. UHI is a bit of a misnomer, should probably become something like Regional Development Heating or Localized Economic Heating. I have a feeling that much of it is driven by water use. Agriculture is probably a large part. Some is probably a biological feedback from warming and GHGs. Anyway, the heating of land being greater than over oceans is probably indication that GHGs aren’t a major driver. Anyone every look at temperatures data and water use? What about aquefer level change? Theoretically if we kept all sources of heat input constant, by reducing the heat capacity of the landscape we can greatly raise regional temperatures. Indeed we have lost 50% of our wetlands and at least in California hydrologist tell me 99% of the streams have been channelized, which drains the subsurface water and dries the land. If you look at the USHCN annual maximum temperature trends of Tahoe City in California and 200 miles away Battle Mountain in Nevada they report a cooling trend since the 30s. However in between those two stations is Winnemucca which reveals a contrasting steeply rising trend for maximum temperature. Such a contrast can only be created by local landscape changes. And sure enough after the Derby Dam was built on the Truckee River that drains Lake Tahoe in the early 1900’s, Lake Winnemucca was turned into a dry lake correlating with the steep rise in temperature. Most of the southeast USA has exhibited a well documented cooling trend. Everywhere that is except south Florida where the draining of the Everglades has been associated with less rainfall and higher temperatures. and Marshall, C., et al. (2004) The impact of anthropogenic land-cover change on the Florida peninsula sea breezes and warm sensible weather. Mon. Weather Review., vo. 132, p.28–52. They came to the same conclusion regarding droughts and found that a climate shift occurred in the Great Plains 500 years ago using tree ring data, age dating and defining the timing of sand dune migration, as well as archeological data — supporting previous findings for the central and SW U.S.. Droughts of the 1200-1300s would make the Dust Bowl seem insignificant. Peterson, Peterson – why is that name familiar? What has he been discredited on before?